each episode approx 1 hour. Once again I’m astounded by the creative sci-fi writing for British television. I’ve been a fan of Doctor Who from way back. Get past the what are now, and even then, considered cheesy special effects, and you find some very smart writing in these series. When the Doctor Who TV series experienced a rebirth back in 2005 I was wary. I was afraid they would not be able to keep up with my image of Doctor Who, I was a huge fan of Tom Baker’s portrayal of the Doctor. How could they keep up with the humor and the fun in space and time travel? 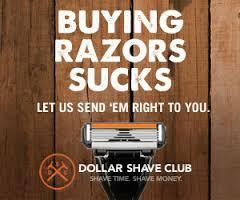 Well only recently I decided to give it a try. I had six seasons to watch and I watched them all. I was astounded. The writing was excellent and all of the new doctors kept the tradition alive. David Tennant was my favorite of the New Doctors, since he was the closest to what Tom Baker brought to the character. This second spin-off series, “Torchwood,” was one that really got my attention. “Torchwood,” is a series about alien hunters that were established by Queen Victoria in 1879. The Doctor saved the Queen from a werewolf at the Torchwood Estate, in Scotland. After the Doctor saves her she knights him and then banishes him and establishes Torchwood to keep out all aliens. (Something note here; Torchwood is an anagram for Doctor Who.) Later in the Doctor Who Series Torchwood blasts an alien ship out of the sky, which The Doctor had just made it’s passengers promise to never come to Earth again. Going against the Doctor on this the British Prime Minister learns not to cross the Doctor. In yet another episode of Doctor Who Torchwood is destroyed by the Daleks. 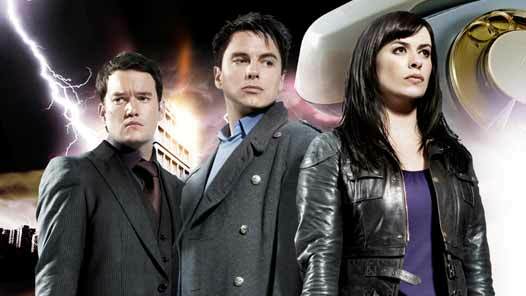 The Torchwood team is led by Captain Jack Harkness, who is a time agent and can never die. He met up with Doctor Who early in the new series and several times there after. After Torchwood is destroyed, Captain Jack rebuilds Torchwood because “The 21st Century is when Everything changes.” He rebuilds the base in Cardiff, Wales, because there is a rift in time and space above/around Cardiff that aliens and time travelers find their way through. His team’s job is to detain the arrivals or if possible send them back, keeping the world safe from aliens. So far the series has run 3 seasons with a fourth one coming soon, according to rumor at the time of this writing. Set between the end of Series Two and the beginning of Series Three, the BBC aired four Torchwood radio dramas featuring the cast of the series, with the first airing September, 2008 and the last three July, 2009. That is the focus of this review. After I watched all of the new Doctor Who series and all the Torchwood series, I had to find more material. 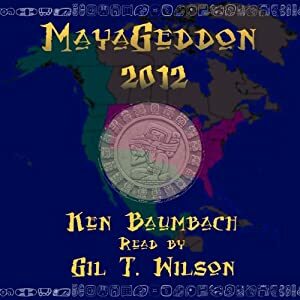 There are other audiobooks available but I wanted to start out with these radio dramas. They are available separately on amazon.com at last check. So, let’s talk about these audio dramas. They all feature the full cast and are written just as well as the TV series. If you want to continue in the Torchwood world it is best to start with these since they do feature the full cast. They also include the same music as the TV broadcasts as well as phenomenal sound effects that blast you into the middle of the story. “Lost Souls” written by Joseph Lidster, begins with Captain Jack Harkness and his crew chasing weevils (annoying aliens that are constantly coming through the rift). Jack gets a call from Doctor Martha Jones, a former companion of The Doctor, who needs his help at CERN. Just hours away from a major discovery in particle physics people have gone missing. Torchwood arrives to find that the people have a particle missing from their atoms and must save the Earth from something brought to our univers via the Hadron Collider. “Asylum” written by Anita Sullivan, is about a girl that comes from the future through the rift, she is caught shoplifting clothes and Torchwood is called in because of the weapon she’s carrying. Turns out the young girl is from a bleak future and has a secret. Why did she come back in time and more important who sent her? “Golden Age” written by James Goss, tells the story of the Delhi branch of Torchwood which was closed down by Captain Jack Harkness back in 1924 yet the people inside are not only still receiving packages addressed to Torchwood but have also found a way to freeze time. This can’t be good for planet Earth. “The Dead Line” written by Phil Ford is more of a haunting tale of a phone call you never want to receive. People in Cardiff are winding up in the hospital after answering the phone and going into a coma. When the call is traced the phone number is one that has not been connected since 1975. When Jack answers one of those calls it is up to Ianto Jones and Eve Myles, the other two members of Torchwood to find answers. Four great sci-fi stories that will leave you wanting more. 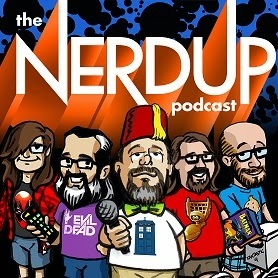 You can always go back and watch the series and check out the other audiobooks based on the series. Glad I could get you started. I’ve been listening to some pretty heavy duty literature lately and decided I needed some light-hearted entertainment. Also I am taking part in the local library’s Adult Summer Reading program and for every ten books read I get an entry into the drawing for some cool prizes, so I needed to find some shorter books. 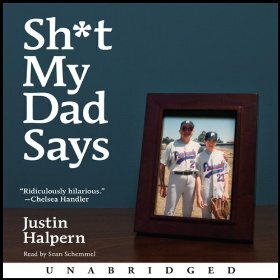 I have been a follower of Justin Halpern’s twitter feed for “Sh*t My Dad Says” before the book and the TV series and and have found the musings to be hilarious at times. This book surprised me in that it not only has those funny quotes but also includes some short stories/essays on various events in Justin’s upbringing. Some of them surprisingly poignant. Justin’s Dad, Sam Halpern, who provides the colorful views of the world comes across a bit harsh at first but after listening to this book I was left with the overview of a worldly wise man that sincerely loves his family. Sam Halpern, is a retired doctor (Nuclear Medicine) and former Navy man and can cuss better than anyone I know. In the book Justin says his favorite is “Bullsh*t,” and can use the word to mean a variety of different things and all those things vary by his intonation. On top of that the reader, Sean Schemmel is able to portray Sam exactly the way I heard him when I read the tweets, and is able to discern the different intonations of “Bullsh*t.” Sean does a superb job of voicing this fun book. I will say that if foul language highly offends you, you may want to stay away…but they are only words in fact Sam Halpern says this, “”They’re offended? F–k, s–t, a—-le, s–tf–k; they’re just words…Fine. S–tf–k isn’t a word, but you get my point.” I found the book extremely funny and for 3 days my commute to and from work was the best ever. I could list several quotes in this review but instead I’ll just provide the link to the twitter feed so you can get a good idea of some of the quotes, but keep in mind many of the good parts of this audio book are the stories told. Many of the stories are in reference to a father providing help in the different phases of any kid growing up, at times I recognized myself in the stories and while Justin Halpern had a more colorfully described life, I could definitely relate. When all is said and done this book is basically about a man that loves his family and will do anything for them, the rest of the world can go to hell. I still haven’t had the chance to see “Wicked” the musical, but I couldn’t just stop after reading the book. I found Gregory Maguire had written two sequels to the book so I thought I would get going on that aspect of the story. So here it is I’ve just finished “Son of a Witch” and have found the story to be interesting but didn’t seem to close out the story. In the interview at the end of the audiobook the author says he doesn’t have any plans to come up with another book in the spin off from the world of the Wizard of Oz. But it seems as though this book screams for a sequel. In that same interview Maguire says he got the idea from two sources; the numerous letters from young female fans who wondered what happened to Nor (daughter of the witch) and after seeing the torture photos from Abu Gharib prison. The problem with this is that this book seems to leave even more questions about what happened to Nor, although the prison scene is in the book. This audiobook is read by the author and after reading stories (he also writes children’s stories) to children he has honed his craft of quality voice acting. Maguire delivers the story probably the way it should be, the voices all sound as he intended so you get more depth to the characters. His delivery is perfect for the story and the different characters come across well defined. Keep in mind this is a story from the “Land of Oz” so there are some interesting characters such as, a talking Goose, a Phoenix and an Elephant disguised as a human princess. Each one comes across just as you and the author would think they should sound. 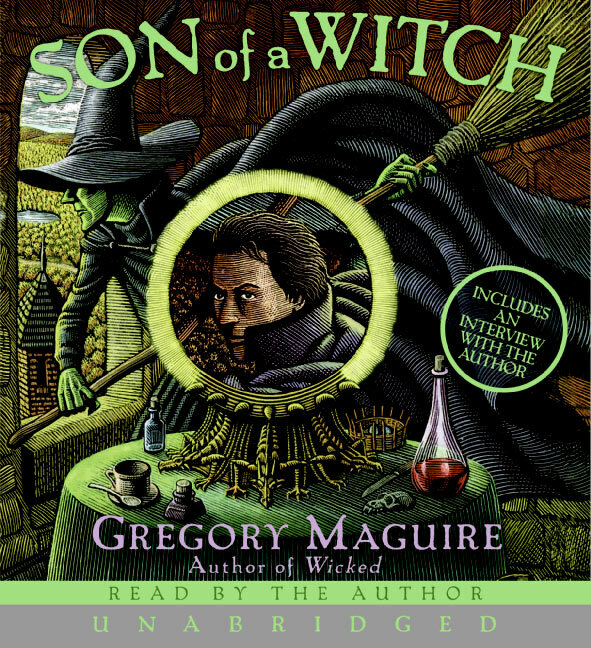 The first section of the book consists of a series of flashbacks that jump back to after the Wicked Witch of the West (Elphaba) is killed by Dorothy and Liir (the Son of the Witch) accompanies her and her band (Scarecrow, Tinman, Lion and Toto to) back to the Wizard, and the “present” when Liir’s body is found along the roadside thought to be another victim of “The Scrapings.” Citizens are found dead with their faces scraped off by some mysterious force. When Liir is found to be still alive he is brought back to the Cloister of Saint Glinda in the Shale Shallows. The Superior Maunt recognizes the young man and identifies him as Liir, the young boy who left the Cloister with Elphaba a decade or so ago. In the “present” time Liir is brought back to health by A Quadling girl, Candle who rarely speaks, and only in her native tongue, Qua’ati (though she understands other speech). Raised in Ovvels, she and some relatives became itinerants. She is left at the Cloister of Saint Glinda by her uncle, and ends up working in the kitchen under Sister Cook. She becomes a skilled player on the domingon, a Quadling musical instrument which sounds like it closely resembles a lute. When a phoenix plucks one of its own feathers to give to Candle and place in the domingon, the instrument seems to be complete, and Candle is able to “play” Liir Back to health by making him remember his past. Candle and Liir are forced to leave the Mauntery and seek shelter in an abandoned farm which also served once as a press for an underground newspaper. Liir then learns he must go back to Oz and destroy the dragons, reclaim his broom and cape (which belonged to his mother) and guide the Council of Birds to Safety. In the process Liir learns his uncle Shel is now the Emperor of Oz and is running a corrupt government. The big lesson for Liir in this is that the he cannot simply sit back and let the world go by, he must take part in it in order to make change. 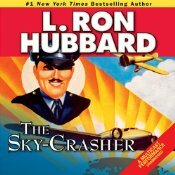 The story remains very interesting and entertaining, but I feel the book was not complete. I guess that’s why Maguire wrote the sequel “A Lion Among Men,” which is on my summer reading list.